Protect your rights and maximize your payout after a Mississippi car accident. We answer key questions and show you how to build a strong insurance claim. Vehicle accidents are life-changing events. One minute you’re on your way to work or taking the kids to soccer practice, and the next minute you’re on the side of the road calling for help. In the aftermath of a car accident, you’ll want financial compensation for your expenses and losses. To build a successful insurance claim for your damages, you’ll need to know what to do, and how to avoid costly mistakes. Here are 12 steps to building a successful auto accident insurance claim. You’ll also find answers to the most frequently asked questions after a Mississippi car accident. Will the police be dispatched to the accident? What are my legal duties after a car accident? Can I be sued for helping the injured? What if no one was injured? What if I hit a parked car and no one is around? What if I hit other kinds of property? What is the role of law enforcement at the accident scene? Do police officers have to listen to my side of the story? What information will be helpful to my claim? What does the Cooperation clause mean to me? Do I have to report an accident if no one is hurt? Do I have to report an accident that wasn’t my fault? Are there mobile apps for accident claims? What are my options if another driver hits me? Who determines the percentage of fault? How does comparative fault affect settlements? 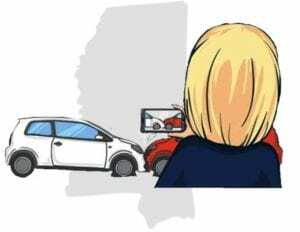 What are Mississippi’s car insurance requirements? Do I have to file an accident report? Do the police have to file an accident report? Where can I get a copy of the police report? When should I consider a small claims lawsuit? 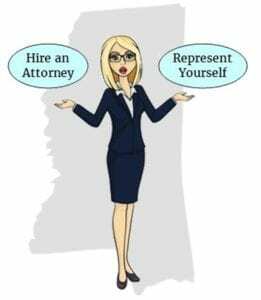 How much can I sue for in Mississippi’s Justice Courts? Do I sue the driver or the driver’s insurance company? 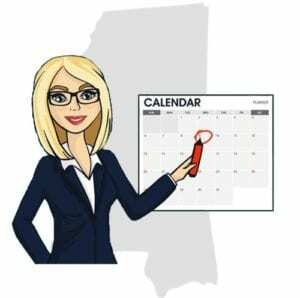 What is the Statute of Limitations in Mississippi? What if the insurance company won’t settle my claim? When you’ve been involved in an accident, stop as close to the scene as you safely can. Check on the other people involved to see if anyone is hurt. Call 911 to report the accident and ask for help, then do the best you can to help the injured until emergency responders arrive. Calling 911 connects you with an emergency services dispatcher, who will ask about the kind of emergency you are reporting. You will need to tell the dispatcher where you are, and what’s going on around you. Give the dispatcher a detailed description of your location, including street names, mile markers, intersections, and descriptions of nearby landmarks. Emergency responders will get there faster if they know where you are. Let the dispatcher know if you or anyone else is injured or asking for medical help. The dispatcher will want to alert emergency personnel to special needs at your location, so report any immediate dangers, like if a vehicle is overturned, on fire, or has gone off a bridge or embankment. In busy jurisdictions, the police may not be dispatched to minor fender-benders. Generally, police will be sent to accidents involving injuries, or where there are traffic problems or reported hazards at the scene. Mississippi traffic laws require any driver who’s in an accident to stop at the scene. If you’re the driver, you must give your name, address and car registration to anyone involved in the accident. If asked, you must also show your driver’s license. You are also legally obligated to render “reasonable assistance” to the injured, including arranging to transport the injured person to a medical facility for treatment. In most situations, this means calling 911 to ask for help. In dire situations, if emergency responders are not at the scene, you may need to take the injured person to the nearest medical facility. Drivers must immediately contact local police to report any accident that causes injury, death, or property damage over $500, usually by calling 911. 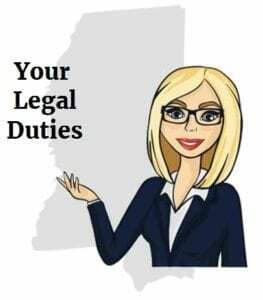 Your legal duties after an accident are not limited to public roadways and also apply to private property such as parking lots, residential property, commercial property, trailer parks, apartment complex property, and any other property in Mississippi where car accidents happen. Under Mississippi’s law, you are protected from liability if you give emergency care to someone injured in an accident or transport the injured person to a place where they can receive medical attention. If the accident only caused property damage, stop to share information with the other driver. Exchange your names, addresses, and vehicle registration numbers. If asked, show your driver’s license. If the damage is $500 or more, report the accident to the local police. Never refuse medical treatment after an accident. Let paramedics examine you and be honest about every symptom you may be experiencing. This is not the time to be stoic. If the paramedics want to transport you to the hospital, let them take you. Vehicle crashes are violent events. Even potentially life-threatening injuries, like internal bleeding or head trauma, may not show symptoms until hours or even days later. If you aren’t taken directly to the hospital, you’ll need to be seen by a medical provider as soon as possible after the accident. Delaying medical evaluation and treatment can seriously undermine your insurance claim when the insurance company takes the position that your injuries were not caused by the accident. If you hit a parked and unattended vehicle, stop and assess for damage. If there is no damage to the car you hit, and the car’s owner was negligent for leaving it there, you are not required to notify the owner. If there is damage, try to find the owner and provide your name, address, and car registration. If you can’t locate the owner, leave a note on the car with your name, address, and an explanation of what happened. If you crash into property along a highway or road, like a fence or telephone pole, that causes damage to the property, you must try to find and notify the owner or person in charge of the property. Once located, give that person your name, address, and the registration number of the car you were driving. If asked, you’ll have to show your driver’s license. If the property damage is $500 or more, report the accident to police. Law enforcement officers are highly trained in accident scene investigation. When police officers are on the scene, it’s important for you to fully cooperate with them. Law enforcement officers will take charge of the accident scene, assessing hazards, securing the location and managing traffic. Coordinating with other emergency services, the police officer on the scene will see to the immediate needs of the injured and arrange for their transportation to medical facilities for further treatment. The police will thoroughly investigate the accident, determine fault, and gather information that will be part of the officer’s official crash report. During the investigation, the officer may conduct sobriety tests, question those directly involved in the accident as well as witnesses, issue traffic citations, and more. No. While, you have the right to try to tell the officer what you think caused the accident, the officer is not required to listen to you. Always cooperate with police and follow the officer’s directions. You risk getting a ticket, or even getting arrested if you make confrontational remarks, or behave aggressively. It depends. 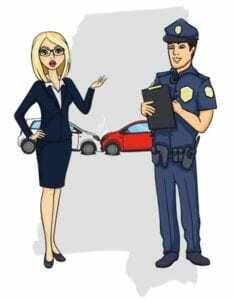 If the officer is asking you to identify yourself, including your full name and address, proof of registration, and proof of insurance, you must comply. However, if you are being questioned about possession of drugs or any other activity that could result in criminal charges, you have the right not to answer those questions. If a police officer decides you violated Mississippi traffic laws, you may be issued traffic citations. You can try to talk the officer out of writing you a ticket, but once a citation is issued, you should accept it. It’s important to know signing the citation is not an admission of guilt. Argue about the ticket in court, not at the accident scene. Accident scenes are fluid. Before long, cars are towed, drivers and witnesses leave, and the police head to the station to file their crash reports. You have a small window of time to collect evidence that can make or break your insurance claim. The evidence you gather may not only prove the at-fault driver was negligent, but it may also help protect you from claims made by the other driver. Property damages include the cost to repair your car, the value of your car if it’s a total loss, the value of personal items destroyed or damaged in the crash, and sometimes the cost of a rental car while your vehicle is being repaired. Personal injury damages can include the costs of medical, chiropractic and dental diagnosis and treatment, your out-of-pocket costs for medicines and medical supplies, replacement services, mental health services, transportation for treatment, and more. You’ll need identifying information about the cars and the people involved in the crash. Gather driver and passenger full names, home and business addresses, telephone numbers, email addresses, dates of birth, and driver’s license numbers. If the driver doesn’t own the car, ask for the owner’s name and contact information. Get the make, model, year, license plate number, expiration date, and vehicle identification number (VIN) for each vehicle involved in the accident. The VIN can normally be found in the left lower corner of the dashboard near the windshield, on the driver’s insurance card, or inside the door jamb of the driver’s side door. Don’t go into another person’s car without permission. Draw a diagram of the accident scene. Show the location of the cars before and after the accident and indicate which way each car was heading. Note the time of day the accident occurred, the weather conditions, if it was bright and sunny or dark, and the road conditions. Write down your impressions of anything you saw, heard, or felt before and during the accident. Did you feel a jolt? See a passenger throw something away? Smell alcohol? Include every detail. Yes. Take multiple photos and videos with sound. Use your digital camera, cell phone, tablet or any other device. The images you collect can verify the position of the cars immediately after the collision, the weather, road obstructions, traffic lights, street signs, and other relevant information. Pictures and video can reflect the demeanor of the driver and passengers, and capture admissions of fault, signs of intoxication, and other incriminating information, making it very hard for the other person to change their story later. Witnesses do not have a legal obligation to speak with you or give you a written statement. If you find a cooperative witness who could be helpful to your claim, ask them to write down what they saw, and sign and date their statement. Be sure to ask each witness for their contact information. Download this free and easy-to-use Car Accident Information Form. Put a copy in your car with a pen, in the same place you keep your proof of insurance. You’ll always be ready to collect vital information from an accident scene. Your auto insurance policy is a legal contract between you and your insurance company. The insurance company is supposed to defend you when you’re in an accident, but you have to do your part. You have specific obligations under the policy, including telling your insurance company when an accident happens. Yes. You are obligated to notify your insurance company of every accident, even if it’s a minor collision and everyone says they’re fine. Failure to notify your insurance company is a breach of your contract that could cause your insurance company to raise your premiums, decline to renew your policy, or even cancel your insurance policy. By promptly reporting the accident, you give your insurance company the best chance to protect your interests, if someone from the other car decides to hire a lawyer or begins to complain of injuries hours or days after the collision. Yes. You are obligated to notify your insurance company of every accident, even if the accident wasn’t your fault. Your insurer can still protect you, even if the accident wasn’t your fault. For example, when the other driver is uninsured or underinsured, or changes their mind and decides to blame you for the crash. Additionally, after a crash your insurance policy may be able to provide you with immediate benefits, like car repairs, to be later collected by your insurance company from the at-fault driver or their insurer. Here are a few free car accident reporting apps. Your insurance company may offer a similar application. 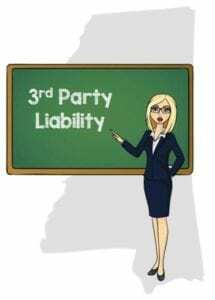 Mississippi follows a third-party liability rule for car accident claims. 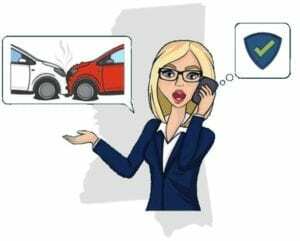 Unlike no-fault insurance states, where both drivers in a car accident turn to their own insurance to pay for damages, a car accident victim in Mississippi can ask for compensation from the at-fault driver’s insurance company. 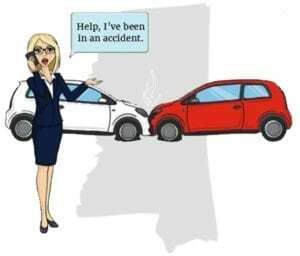 Mississippi uses the pure comparative negligence rule to determine each driver’s percentage of fault for causing an accident and uses those percentages to calculate eligibility for financial compensation. In practical terms, this means if you have property damage or personal injuries from a car accident, you can pursue the other driver for compensation, even if you are partly to blame for the accident. To take it a step further, as long as you’re not 100% responsible for causing the accident, you can still pursue a claim against the other driver, even if you are the driver most at fault. Insurance companies are usually the first to determine the percentage of fault between claimants and their insured. If a settlement cannot be reached, the claimant may file a lawsuit, and the allocation of fault will be determined at trial. Once the comparative fault of each driver is determined, your compensation will be reduced by the percentage of your liability for the accident. Rosanna was driving home in the right lane of the interstate. Aaron was also in the right lane, traveling behind her. Aaron wanted to pass Rosanna, so he moved into the center lane and increased his speed. Once he thought he had passed her, Aaron started moving back into the right lane. Unfortunately, when Aaron moved back into the right lane, his car hit the front of Rosanna’s car, causing both cars to run off the road and injuring Rosanna. Rosanna filed a personal injury claim with Aaron’s insurance company, demanding $50,000 for her medical bills, and pain and suffering. The insurance company decided that Rosanna was partly to blame for the accident because she sped up when Aaron was trying to pass her. They would not agree to pay her $50,000, so Rosanna filed a lawsuit against Aaron. During trial, the jury learned that Aaron was ticketed at the scene for moving into the right lane before it was clear for passing. The jury also heard witness testimony that Rosanne increased her speed when Aaron was trying to pass her. The jury determined that Aaron was 60% at fault for the accident, for moving back into the right lane before it was clear. But Rosanne also had a part in causing the accident. While the jury agreed that Rosanne had $50,000 worth of damages, they found that she was 40% to blame for the crash. 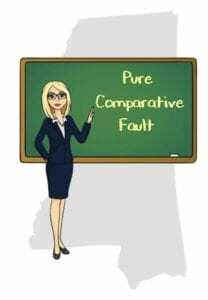 Based on Mississippi’s Pure Comparative Fault rule, Rosanna was awarded $30,000, representing a 40% reduction to the $50,000 settlement she sued for. Under the Pure Comparative Fault rule, even if the jury had determined Rosanna was 99% at fault for the accident, she still would have been able to recover 1% ($500) of her damages. 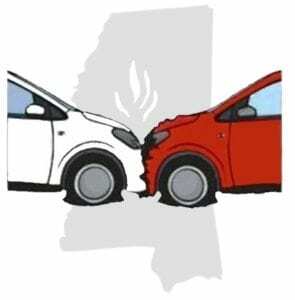 Mississippi requires vehicle owners to carry bodily injury liability coverage of no less than $25,000 per person for one accident, and $50,000 for two or more people per accident, as well as $25,000 in liability coverage for property damage. Liability coverage pays for injuries and property damage caused by the insured driver. Underinsured motorist coverage pays for you and your passengers if you are injured by an at-fault driver who doesn’t have insurance. Underinsured motorist coverage kicks in when the cost of your damages exceeds the amount of liability coverage carried by the at-fault driver. 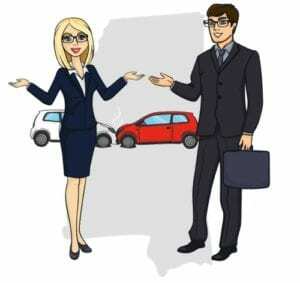 Mississippi law requires insurance companies to provide uninsured and underinsured motorist coverage in amounts equal to the levels of liability coverage on your policy, in any case no less than bodily injury coverage of $25,000 per person for one accident and $50,000 for two or more people in one accident. If you don’t want to pay the added premiums for uninsured and underinsured motorist coverage, you must reject the coverage in writing, using a mandatory form. If you have questions about your current uninsured or underinsured motorist coverage, contact your insurance agent. Drivers are not required to file a written accident report in Mississippi. But remember, if you’re in an accident that involves injuries or death, or there is property damage valued at $500 or more, you’re required to contact the local police department by the quickest means of communication available. For most of us, that means calling 911. If the police are called to an accident involving death, injuries, or property damage valued at $500 or more, the officer is required to file a written report. Mississippi Uniform Crash Reports may only be requested by a crash victim, the victim’s family member, or the victim’s legal representative. 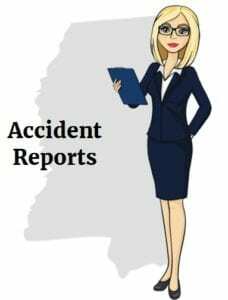 To purchase a copy of the police accident report, go to the Mississippi Department of Public Safety Online Collision Reports page. There are some claims you can successfully negotiate yourself. Other claims require the help of an experienced personal injury attorney to get the insurance company to pay a large enough settlement amount to cover your damages. Before you decide to represent yourself, think about the type of injuries you’ve suffered, and what it will take to get an appropriate settlement. There are generally two types of injuries from car accidents. “Soft tissue” injuries include strains and sprains, minor bruising and abrasions, whiplash, and other relatively minor injuries. Soft tissue injury claims include the cost of treatment and therapy bills, some lost wages, and a nominal amount for pain and suffering. “Hard” Injuries are much more serious and can include head trauma, spinal injuries, deep lacerations, amputations, disfigurement and other potentially life-threatening conditions. Hard injury claims often include the cost of extensive medical care and treatment, hospitalization, rehab, lost wages, replacement services, and a tremendous amount of pain and suffering. Hard injury claims require high-dollar compensation. Insurance companies are reluctant to part with that kind of money, and typically make smaller settlement offers to claimants who are unrepresented by legal counsel. Once the insurance company makes their “final” offer, they know you probably won’t have the skill or energy to fight them. There’s just too much to lose by representing yourself. High-dollar claims often require the onset of litigation and a myriad of pre-trial tactics like expert testimony, interrogatories, record subpoenas, depositions, and more. You’ll need a skilled personal injury attorney to convince the insurance company to pay the amount of compensation you deserve for your serious injuries. Reputable personal injury attorneys offer a free initial consultation. You can interview as many attorneys as you want before hiring the attorney who will fight for you. Before the initial consultation, gather all your important papers related to the accident. Be sure to include your evidence from the accident scene, medical records, your copy of the police report, your notes about the accident, and any communications with the at-fault driver’s insurance company. After reviewing your documents, the attorney will discuss the potential value of your case, how long it might take to settle your claim, and if a lawsuit will be necessary. Most personal injury attorneys will agree to represent you on a contingency fee basis. A contingency fee means you won’t pay the attorney until the attorney successfully settles your case or wins it at trial. The attorney’s fees will be subtracted from the amount of your settlement or court award. Contingency fees can range from 25% to 40% depending on the time it will take to resolve the case, the complexity of the case, the attorney’s outlay of costs, and if the case goes to trial. If your attorney fails to settle your injury claim or loses your court case, you won’t owe any fees. 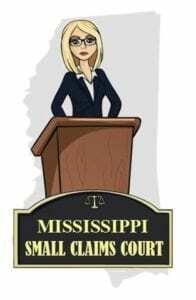 Mississippi refers to their small claims courts as “Justice Courts.” Justice Court judges hear small claims cases, misdemeanor criminal cases, and cases involving traffic offenses that happen outside of a municipality. When should I consider filing a small claims lawsuit? You may file small claims actions in Justice Court valued up to $3,500. You don’t have to hire an attorney to pursue a claim in Justice Court. If you decide to file a lawsuit in small claims court, you must sue the driver who caused the accident, not the driver’s insurance company. The statute of limitations for accident claims is a mandatory period of time to either settle your claim for damages or file a lawsuit against the at-fault driver. Mississippi has a three-year statute of limitations for accident claims. The statute starts to “run” on the date of the car accident. If you haven’t settled your claim or filed a lawsuit against the negligent driver before the three-year deadline, you will lose your right to pursue compensation for your damages from the accident. The insurance company doesn’t have a legal obligation to settle your claim within the statute of limitations period. They don’t have to tell you if the deadline is looming. It’s up to you to keep an eye on the statutory deadline for your claim. You won’t get any sympathy from the insurance company or the claims adjuster if you miss the deadline. They know what happens if you haven’t settled your claim or sued their insured before the clock runs out. Without a signed settlement, if you haven’t filed a lawsuit against the at-fault driver before the statute of limitations expires, your claim is extinguished. Don’t risk forfeiting your right to seek compensation for your injuries. Know the statutory deadline for your claim. Put reminders on your cell phone, computer, refrigerator, and anywhere else that will remind you when the time is getting short. Don’t wait until the deadline to act on protecting your claim.